Johnny Cash was among the most distinctive artists and personalities in American music history. Through his music and his life, he brought together contrasting elements of American culture in a way that nobody else could. He was immensely respected and admired by rock fans and country fans alike. His music and his strong views on social issues had appeal to both the political left and right. His lifelong struggle with drug addiction existed side by side with a lifelong devotion to Jesus Christ. And as his life was drawing to a close, he found passionate new fans among a young generation whose grandparents had originally fallen in love with him and his music. John R. Cash was born on February 26, 1932, in Kingsland, Arkansas. His father, Ray, and his mother, Carrie, had a total of seven children. As a young boy, John worked with his family on a farm growing cotton and other crops. He developed a love of music from folk songs that his mother sang, hymns sung in church, and tunes he heard workers sing in local farms and railroad yards. Trains would be a recurring theme in his later music. Cash put his first band together while serving as a radio operator in the U.S. Air Force in Landsberg, Germany, in the early 1950s. The name of the band was an early indication of Cash’s mischievous nature—the Landsberg Barbarians. In 1954, Cash was living with his new wife Vivian in Memphis, Tennessee, and working as an appliance salesman. In 1955, he launched his recording career with Sun Records—the same Memphis label where Elvis Presley was simultaneously beginning his own career. Cash’s first release with Sun was the self-penned “Hey Porter,” recorded with his small band of Luther Perkins on guitar and Marshall Grant on bass. 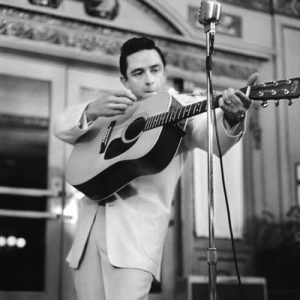 Although this song is now considered a classic—the first to showcase Cash’s powerful baritone voice and Perkins’ simple but catchy guitar lines—it did not chart at the time. Johnny Cash and the Tennessee Two’s next releases, however, were chart successes. These songs, all written by Cash, included “Cry, Cry, Cry” (1955), “Folsom Prison Blues” (1956), and “I Walk the Line” (1956, Cash’s first number-one hit). Johnny Cash, Luther Perkins, and Marshall Grant work their way through the unique chord structure and key changes of Cash’s “I Walk the Line” around 1956. In 1958, Cash moved to Columbia Records, where the big hits continued and his fan base kept expanding through the late 1960s. Many of his recordings during this period were characterized by a combination of traditional country sounds and folk sensibilities. Examples include “Don’t Take Your Guns to Town” (1958), “Five Feet High and Rising” (on a 1959 album but not released as a single until 1974), “The Rebel–Johnny Yuma” (1959), and “The Ballad of Ira Hayes” (1964). His recording of Bob Dylan’s “It Ain’t Me Babe” (1964) was an unusual and daring song choice for a country singer at the time. He gave a young songwriter named Kris Kristofferson an early career boost by recording his “Sunday Morning Comin’ Down” in 1970. In his self-written “Man in Black” (1971), Cash expressed his social consciousness by describing the injustices of the world that his dark clothing was meant to represent. Cash singing Kristofferson’s “Sunday Morning Comin’ Down” in the early 1970s. The instrumentation in some of his songs was also unusual for country songs of the time. A good example is the prominent horn section in “Ring of Fire” (1963), written by his singing partner and future wife June Carter in collaboration with Merle Kilgore. Duet hits by Cash and Carter included “Jackson” (1967), “Long-Legged Guitar Pickin’ Man” (1967), and “If I Were a Carpenter” (1970). John singing “Ring of Fire” in 1968, backed by the vocals of June Carter and her sisters. Two live albums cemented Cash’s reputation as a great American musician. Both were recorded in prisons: At Folsom Prison (1968) and At San Quentin (1969). A huge hit off the latter album was Shel Silverstein’s “A Boy Named Sue,” which stayed at the top spot on the country charts for four weeks. John performing “Folsom Prison Blues” at San Quentin State Prison, from the 1969 live album. In 1969, the Country Music Association (CMA) honored Cash with its Entertainer of the Year and Male Vocalist of the Year awards. From 1969 to 1971, he hosted The Johnny Cash Show on ABC television. On the show, he featured a range of guest artists from different musical genres as well as frank discussions on such social and political subjects as the Vietnam War, race relations, and prison reform. As Cash’s career was peaking during the mid-1960s, so were his addictions to amphetamines, barbiturates, alcohol, and a hell-raising lifestyle. For a while, he and Waylon Jennings, who also had a drug habit and wild ways, shared an apartment, where they would hide their pills from each other. Cash’s marriage to Vivian ended in divorce in 1967. In 1968, he married June Carter. Through June’s love and help, John found the strength to fight his addictions. Another source of strength was his deep religious faith, focused on Jesus Christ as his savior. Although he beat his drug addiction for several years, he would spend much of the rest of his life struggling with some form of it. As his health declined later in life, an addiction to pain killers and a dependence on other prescription drugs developed. John and June performing “The Old Rugged Cross” together in a stadium packed with believers. Cash’s hits became less frequent in the 1970s and 1980s, and many critics believed that his most creative days were behind him. One of his more popular songs during this period was the humorous “One Piece At a Time” (1976). Another was “There Ain’t No Good Chain Gang,” a 1978 duet with Jennings. In 1985, Cash, Jennings, Kristofferson, and Willie Nelson formed the country supergroup The Highwaymen, which released three albums over a period of 10 years. The four friends toured together and were obviously enjoying themselves on stage while making their fans happy. Kris, Waylon, Willie, and John performing the beautiful but sad “Desperados Waiting For a Train” live in concert. In addition to his music career, Cash also acted in a number of movies and television shows, including A Gunfight (1971, with Kirk Douglas), Columbo, Little House on the Prairie, and Dr. Quinn, Medicine Woman. And he performed frequent advocacy work for prison reform, Native American rights, and Reverend Billy Graham’s evangelical organization. Cash’s creative juices suddenly became re-energized in the mid-1990s when he signed with the American Recordings label. Producer Rick Rubin, best known for his work in rap and rock, delved deep with Cash on a series of four albums released between 1994 and 2002: American Recordings, Unchained, American III: Solitary Man, and American IV: The Man Comes Around. These records earned Cash multiple Grammy, CMA, and other awards; much critical acclaim; and a new generation of fans who heard the songs on college and alternative-rock stations. Although John’s voice was often weak and trembling, the raw emotion of the sometimes stark and simple, other times rockin’ and edgy recordings struck a chord with a public that was hungry for any honesty in modern music. The 2003 video of Cash’s version of the Nine Inch Nails’ song “Hurt,” which appeared on the album American IV: The Man Comes Around. Cash suffered from many health problems in his final years, including neurological and respiratory conditions, diabetes mellitus, and failing eyesight. He died from complications of diabetes on September 12, 2003. His beloved June had passed away only a few months earlier, on May 15. In 2005, a movie based on the love story of John and June, Walk the Line (starring Joaquin Phoenix and Reese Witherspoon), was released to popular and critical applause. In 2006 and 2010, a fifth and sixth album in the American series were posthumously released. Johnny Cash is one of the few singers who is an inductee of both the Country Music Hall of Fame (1980) and the Rock and Roll Hall of Fame (1995). He is also in the Nashville Songwriters Hall of Fame (1977). David Kemp. American Communion. Vanity Fair. February 23, 2010. Johnny Cash. Man in Black. Zondervan, 1975. Johnny Cash with Patrick Carr. Cash: The Autobiography. Harper San Francisco, 1997.